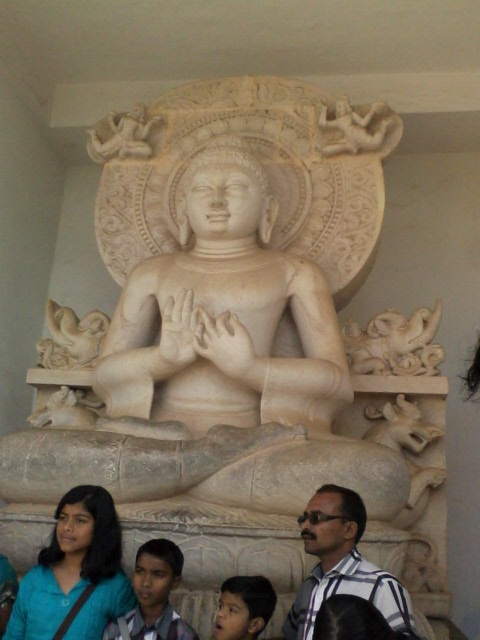 Bhubaneswar - Temple city of Odisha - Ghumakkar - Inspiring travel experiences. We had started our Journey from Kolkata to Puri and reached Puri at 0400 hrs and finished our Darshan at the Lord Jagannath Temple at 0830 hrs. Thus we had full day with us to explore nearby excursion or tourist spots as our train to return to Kolkata was scheduled for next day morning. We came back to our Hotel, had breakfast at the Restaurant next to our Hotel and booked a car. We decided to cover Bhubaneswar, Konark and Chandrabagha beach by evening which was very well possible in 08 hours as suggested by local people. Bhubaneswar (Details from Wikipedia) – It is the capital city of Odisha . 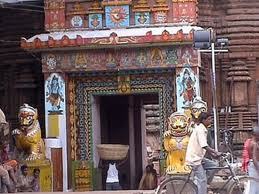 It is the largest city of Odisha, and a centre of economic and religious importance in the region today. Bhubaneswar possession of magnificent sculptures and architectural heritage make this city as one of the great religious centres of Odisha since early medieval days. With its large number of Hindu temples (over 600 in number), which span the entire spectrum of Kalinga architecture, Bhubaneswar is often referred to as a Temple City of India and together with Puri and Konark it forms the Swarna Tribhuja (Golden Triangle); one of the most visited destinations in eastern part of India. 0900 Hrs – We started from Puri. We were informed by the Driver that we will first go to Bhubaneswar and on our return we will cover Konark and Chandrabagha beach. He told us that it will take 02 hrs to reach Bhubaneswar which is approximately 70 Kms from Puri. So we decided to take a nap as woke up today at 0400 hrs. 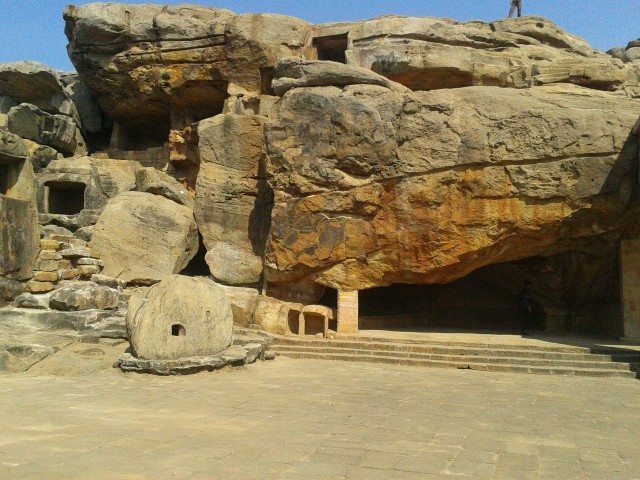 1100 Hrs – We first reached at Udayagiri and Khandagiri caves. 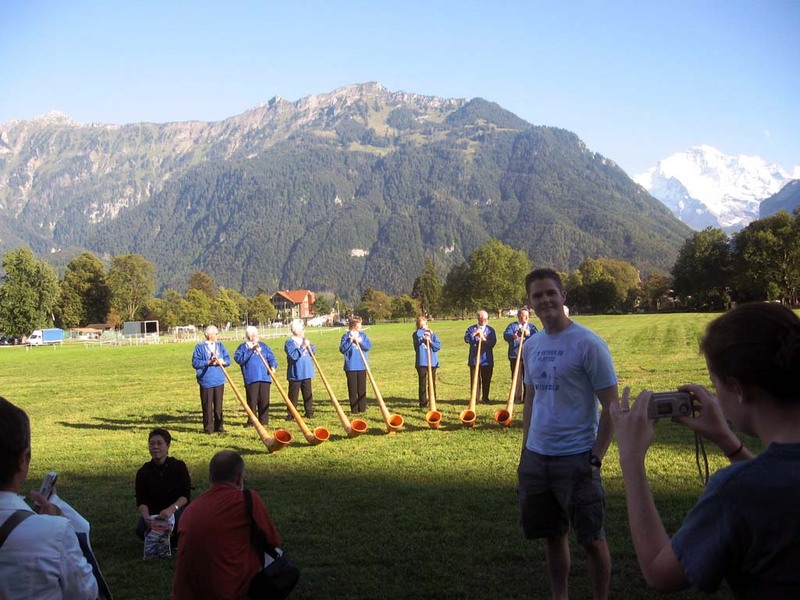 It is a typical tourist destination with numbers of tea and snacks shop and a big parking area for Buses and car parking. The monument remains open from sunrise to sunset. Entry fee for Citizens of India and visitors of SAARC (Bangladesh, Nepal, Bhutan, Sri Lanka, Pakistan, Maldives and Afghanistan) and BIMSTEC Countries (Bangladesh, Nepal, Bhutan, Sri Lanka, Thailand and Myanmar) – Rs. 5 per head and for each foreigner is Rs. 100.00 or US $2.00 and free entry for children below 15 years. 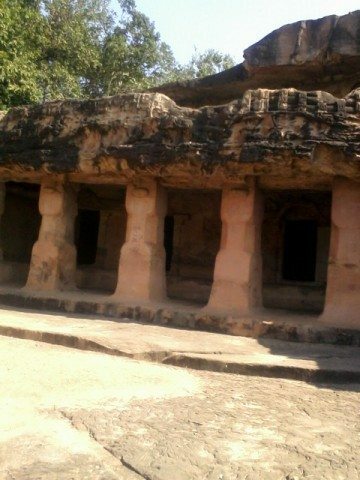 Udayagiri and Khandagiri Caves – The twin hills contains the excavated rock cut caves called LENA in the inscriptions and essentially dwelling retreats of the Jaina ascetic. 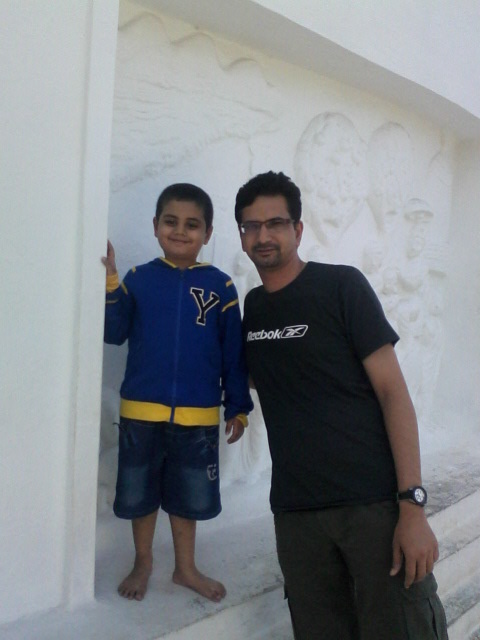 We had purchased the ticket and we first went to Khandagiri caves. These two hills are on either side of a road and one can enter in any hills first. At Khandagiri caves a sloppy path is available from where one can go further and see the caves. On climbing this path one can have a look at the caves on the right side. There are 15 caves at Khandagiri hills. Unfortunately due to very warm climate and climbing we were very much tired we didn’t find these caves so interesting. Somehow we took a quick round of all caves and came down. 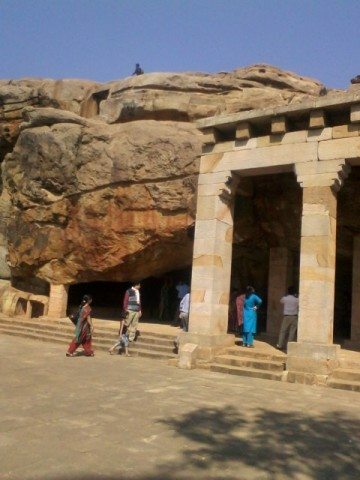 We also decided to miss Udayagiri caves as we didn’t have stamina to climb again to another hillside to see caves. Very nice and detailed descriptions of these caves are available on www.orissatourism.org. If any one wishes to see both the hills and caves then one should have minimum 02 hrs to visit these caves. 1200 Hrs – The next point we reached was Lingaraj temple. Lingaraj temple – The Lingaraj Temple, an ancient temple built dating back to 7th century, is a majestic monument of Oriyan architectural style and craftsmanship. The temple, a massive structure of 147 feet high, is enclosed by fortified walls and is surrounded by many ancient small shrines. It is believed that the construction of the temple took place a long period during the rule of three dynasties. This beautifully and elaborately carved lofty tower is a special attraction of the temple. We were informed by our car driver that don’t get carried away by the Pandas standing at the entrance, also to keep our mobile ,cameras inside the car only as it is not allowed to carry these items inside the temple. So we kept our mobiles inside the car only and proceeded to a wash area where one can wash hand and legs. We quickly washed our legs and came out. Alas, what is the use of washing outside washing place was full of dirty water and we had to jump on that dirty water to enter inside the temple. At the entrance, the security was checking everyone and their belongings. Also many pandas were standing trying to convince people entering the temple to get pooja done. We somehow escaped from the Pandas and entered inside the huge temple complex. Very generically if anyone sees this temple, it resembles like a Puri temple only. But It is a huge, massive structure and temple complex with beautifully carved temples. I must say, the temple was really so beautiful and surprisingly we didn’t find any crowd inside the temple. We entered inside the garbha griha , did darshan and came out to see this beautiful temple complex. The temple complex has many other temples e.g. 12 jyotirlinga small temples etc . This magnificent temple, dedicated to Shiva, represents the type of Hindu architecture. Swayambhu is worshipped both as Shiva and Vishnu. The harmony of the two sects is seen in this temple where the deity is worshipped as Harihara, a combined form of Vishnu and Shiva.The presiding deity, is the Swayambhu Lingam. We finished our darshan and seeing the temple and came out and proceeded to our next point Dhauligiri. 1300 Hrs – We reached Dhauli. Again this place was also like a typical tourist place, too much crowded. There were so many tourist buses that we had to get down a little distance away from the main Shanti stupa and walked up to the point. 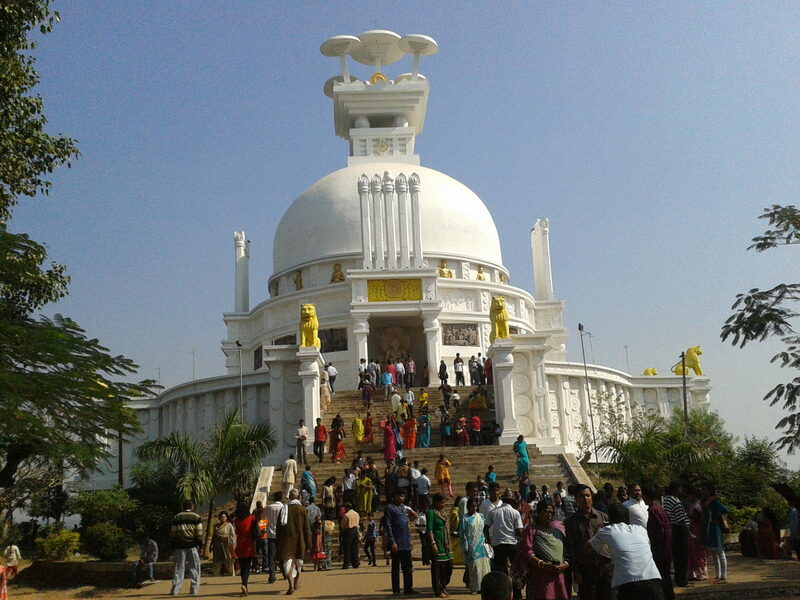 Shanti Stupa of Dhauligiri is also known as the Peace Pagda. Dhauligiri lies at a distance of 7 Km from Bhubaneswar. As one travels from Bhubaneswar to Puri, one finds Shanti Stupa. The word ‘shanti’ in the name itself suggests peace. 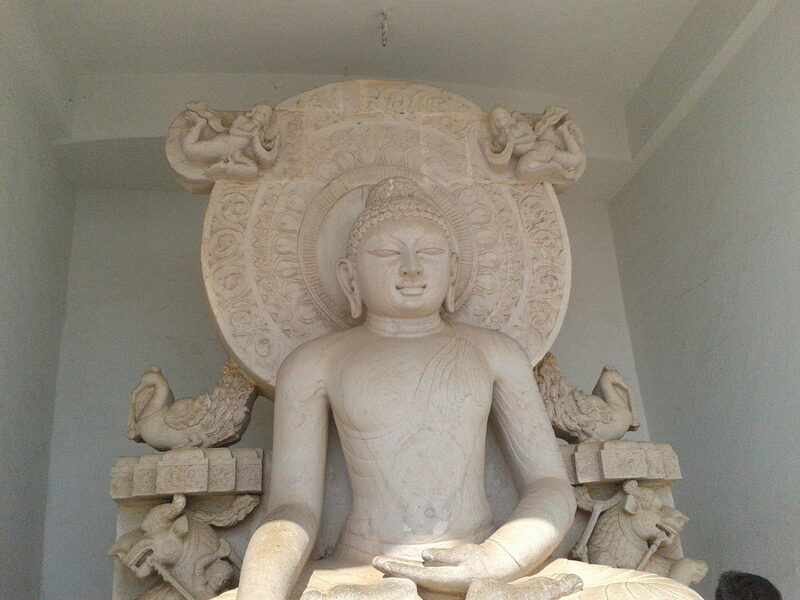 Since King Ashoka adopted the path of peace and tranquillity and resorted to Buddhism, he laid the foundation of Dhauligiri Shanti Stupa at a place which is known for the end of Kalinga War. Here, one finds the edict of Lord Budddha which is visited by numerous Buddhist devotees. On the top of the hill, this dazzling white peace pagoda has been built by the Japan Buddha Sangha and the Kalinga Nippon Buddha Sanghain the 1970s. The overall structure of the stupa is in the shape of a dome. One can spot the Buddha footprints as well as the Bodhi tree over the stone panels. Over the panels, one also spots the image of Ashoka who keeps his sword of war in front of Lord Buddha suggesting that he had given up the idea of war completely. In the vicinity of this stupa, there lays a monastery named as the Saddharma Vihar Monastery, which is much visited by the Buddhist devotees. And at a short distance from the Shanti Stupa, one can find the temple of Dhavaleshwar that was renovated in the year 1972 and is much frequented by Hindu as well as Buddhist devotees. There were two points which was suggested by our Driver to see at Bhubaneswar, one was Mukteshwar temple and other was Nandan Kannan Zoo. But as we were getting delayed we thought of proceeding to Konark as we do not want to miss Konark Sun temple. This finishes our Bhubaneshwar trip and we then headed to Konark carrying with us beautiful memories of Hinduism, Jainism and Buddhism art and heritage. Nice post and good description on some of the must visited places in Orissa. The history of Orissa or the Kalinga dates back to few thousand years from now and the state has a rich heritage to be proud of. 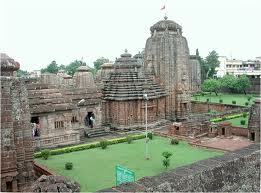 Bhubaneshwar alone has thousand of temples to visit. Visited some of these places long time back, but I have no photographs – so, it is nice to see them again through your post. One of the things which I still remember while coming back from Bhubaneshwar Airport – I couldn’t find any security personnel at the main entrance and proceeded towards counter to collect boarding pass. The aircraft was too small to accommodate 20-25 people and the flight took only 20 minutes to reach Calcutta on my return journey to Delhi on the same night…waiting…only few kms from home, but couldn’t go there to meet everyone. But it was before 9/11, so things must have now been changed long time back. Thanks Amitava for liking the post. You said very rightly that after 9/11 lots of changes happened some are good and some are bad. Feels really bad when you are so close to your family and due to shortage of time could not visit them. For us it was bit hectic,but frankly speaking it was not at all in our plan. Because we finished darshan at Puri so quickly we thought of covering other areas too as who knows when we will get a chance to come here again. I must confess that in my first reading of the post the focus was entirely on the pictures. I loved the Dhauligiri pics and that of the Lingaraj temple complex. The architecture looks stunning! 2.For the carvings and inscriptions on the walls- some are in Devnagari and some others are pictorial. I love to spend a lot of time trying to understand them. Thanks a lot for liking the pics. Infact I am more happy because this is for the first time I am receiving comment from you. You said very right about about cave temples.I am glad that you liked the post. Once time I have been Bhuvneshwar, Konark, Puri & Cuttack. All Places are very nice & can visit again. I have seen whole Udaygiri & Khandigiri. 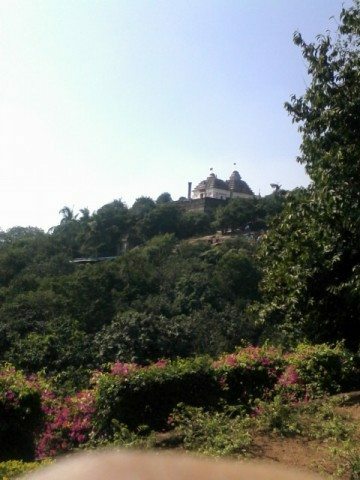 A beautiful Jain Temple at the top of the Udaygiri. Thanks for nice post/click and refreshing my Memory.. I guess after reaching the same morning and then visiting the Jagannath Temple in Puri, you guys must have been tried. Thank for you taking us around but I found it a bit rushed :-). Same thoughts as Archana about the Lingaraj Temple Complex, not sure on why they do not allow cameras. Guess it is not with ASI as yet. Ya, it was bit hectic because it was not at all in our itinery. But we thought that we might not be able to visit this part of India again, so covered as much as we could. Lingaraj temple is not with ASI,but may be I guess because of security reasons it was not allowed. There was very strict checking at the temple entrance. Bhubaneshwar indeed has temples around every corner. Plus it is a nice and clean city. 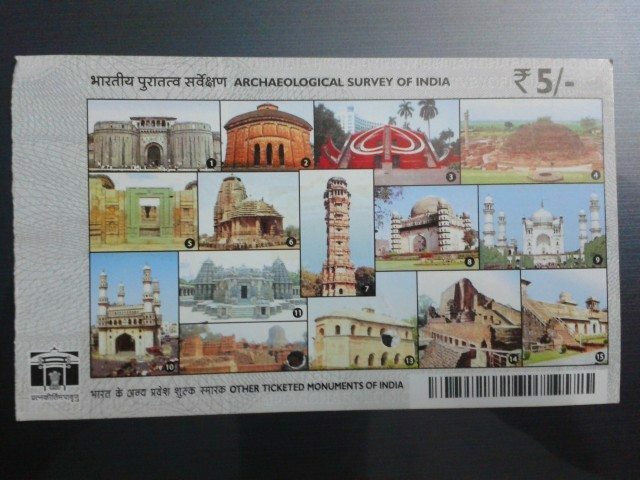 Thanks for liking the post.Ya, I had heard that city has many temples but was able to visit one only. Very nice description, good photos. 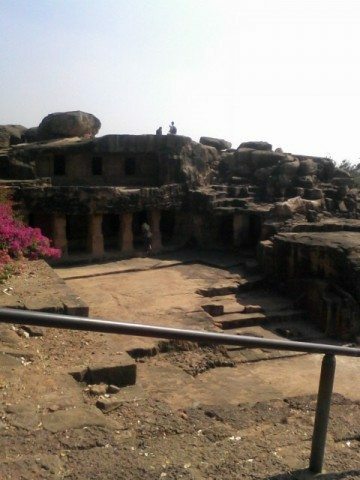 Khandagiri Caves looks wonderful, when rest of world was in stone age and our culture was so developed. Thank you Surinder ji for liking the post. Thank you, Abhee, for a virtual tour of some of the attractions of Bhubaneswar. It is amazing that you managed to visit Udayagiri/Khandagiri, Lingaraj Temple and Dhauli within such a small time frame. It usually is a good idea to defer some visits for a later date unless one is abroad and chances of revisiting the place are not very high. 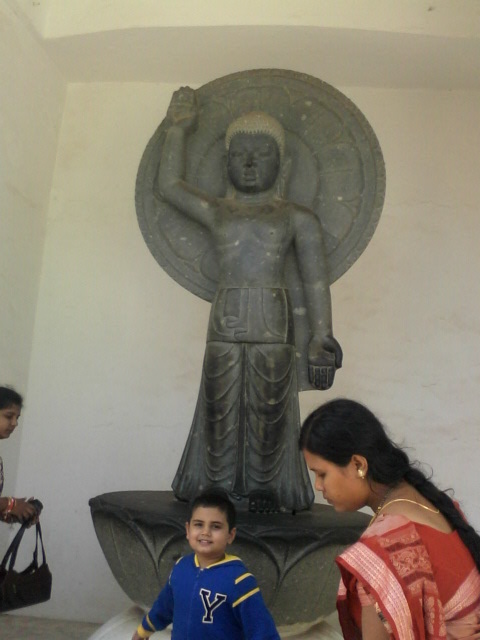 I am sure that you will return to BBSR some time soon to visit the places you missed out upon this time. Permit me to point out a minor flaw in some of the pictures. 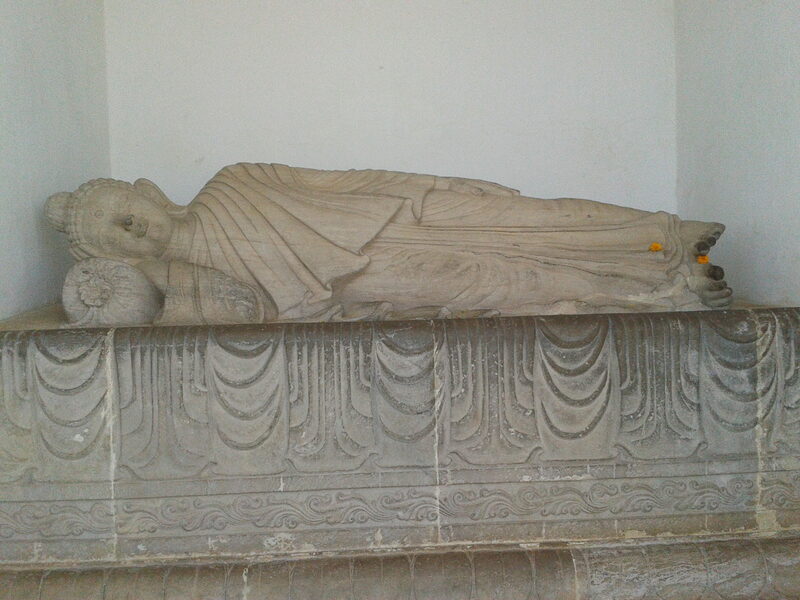 Some of the snaps, like that of the sleeping Buddha at Dhauli, are slightly crooked. While shooting, just ensure that the verticals/horizontals are aligned with the edge of your viewfinder before clicking. Attention to such small details enhances the quality of the images. Waiting for your report from Konark. Thanks DL sir for your comment. Yes, we tried to manage whatever best we could in a day.Hope I will get opportunity once again to visit BBSR and Puri. Thank you very much for the photography tips. Would love to receive such tips from everyone.I should now disclose one thing which most of the Ghumakkar must be knowing.I do not possess any camera,whatever I click is from my mobile that too with not a very good specification of camera.And the worst part is I am very bad in photigraphy. I developed interest in clicking photographs only after I joined Ghumakkar. As I am now very much involved in Ghumakkar my dear hubby gifted me a camera today only just for Ghumakkar. Hope to post good pictures with my new camera in my next posts. good post,nice pics.we get very few posts describing these beautiful places from this part of India. Thanks Ashok ji for liking the post and appreciation. A very nice write up indeed, shall definitely visit Odisha one day. Iam a new entrant so detailed comments freom next time. Hello to everyone.First of all thanks for so many responses in a short span of time and sorry for delay in responding as I was busy in my son’s birthday. This triangle of Orissa is in my list but and your series will definitely help a lot . 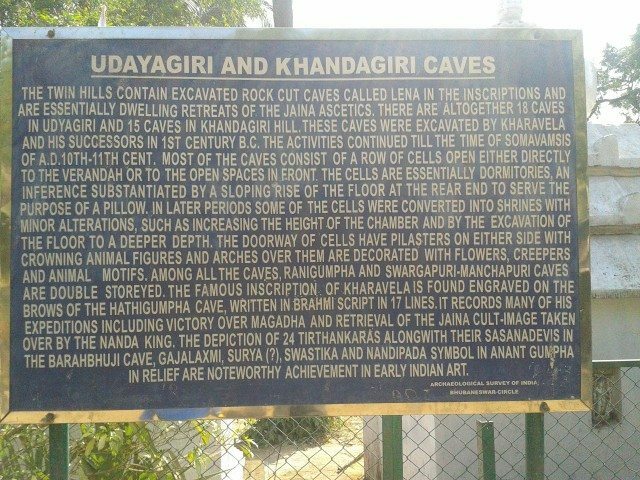 Not heard of Udaygiri and Khandagiri caves though. Your post is to much informative. All over india there are 52 shakti peetha and from 52 there are 4 “ADI” shakti peetha and 2 are present in odisha. So odisha is have its importance from it. I am searching your post for tara tarini ADI shakti peetha which is 2-3 hour from puri but i think as you have time shortage so you had not visited there. i want your help.can u please share the mobile number of pandas who help you u and what charge he takes. Thanks for going through my post and liking it. As regards to panda who has helped us I am giving his phone number below.As regards to charges please see my Puri post comments, you will find lots of information in the comments as well.I hope that will be helpful for you.In case you need any other info which I can provide I will be happy to provide , just let me know. As regards to Shakti Peeth , there is a temple inside Jagannath temple which says “Vimla Devi” Shakti peeth.Panda ji took us there.But other Shakti peeth we didnt go so I would not be able to give you information about that. Thanks a lot Abheeruchi for this information.